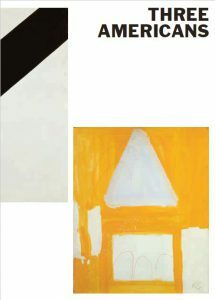 Rare was the American painter, taking up his work in the 1950s, who did not initially try his hand at a variation of the improvised gestural painting that had become the trademark of abstract expressionism, and rare was he who did not soon arrive at the insight that the gestural impetus had worn itself out and that he was fated to become the epigone of a great generation. Abstract Expressionism was most closely embodied by Jackson Pollock, Franz Kline and Willem de Kooning, since the significance of Barnett Newman’s innovative visual interpretation was not recognized until a decade later. The latter’s radical rejection of the European modern age was likely not shared by the numerous young American artists who, with the assistance of the G.I. Bill, travelled to Europe in order to study and gather experiences there. For his colourful papers, Matisse had no longer used oil paint, but gouache, which was quick-drying and produced a matt surface. Held, Smith and Krushenick all tried out the new painting media that were coming onto the market at that time, at the end of the 1950s. Sam Francis initiated Held in painting with Liquitex, an acrylic paint mixed with water that permitted quick working. In around 1960, Smith likewise gave up oil paint and painted with water-based paint, as is used for painting walls. He often used silverbronze too, which emphasized the pictures’ planar appearance. It signalled a radical change for Krushenick, as well, when he used Liquitex for the first time in 1960. It was not really a new beginning: the pictures were, rather, the consistent continuation of the collages made out of painted scraps of paper, and Krushenick was fascinated by the intensive colour effect that he was able to achieve this way. For these artists, the change of painting medium was not a technical, but an aesthetic matter, probably comparable only with the use of distemper, which Vuillard and other Nabis painters preferred to oil paint in their day. The common feature of distemper and acrylic paint was that they both afforded artists the use of an everyday medium; the mundane and unpretentious that adhered to this medium indicated precisely the direction in which the painters intended to go. In reference to composition too, the three painters endeavoured to leave aside refinement and to replace the vigorous gesture with a clear, immediately effective portrayal. For example, Held decided to perform the transition from Pollock’s admired all-over, which had influenced his painting for quite a time, to a new manner of composition. He no longer wanted to repeat and layer shapes and colours on the picture plane; now he placed them singly alongside one another onto the plane, for example a square and a circle, a circle inside a square or, even more simple, a single rectangle that marked the boundary of the plane. [i] Pierre Schneider, “Art News from Paris”, Art News, Vol. 61, No. 4 (Summer 1962), p. 43).